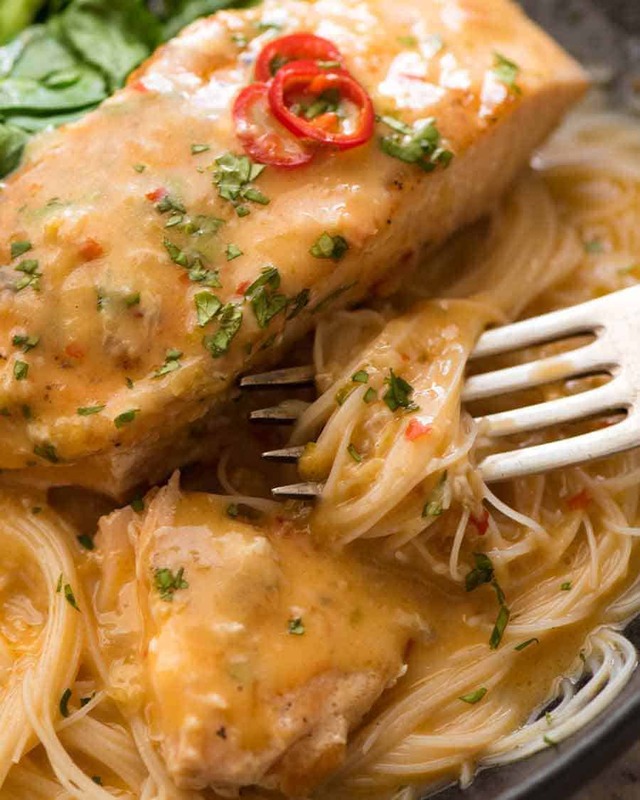 Poached Salmon made exotic with a simple, amazing Coconut Lime Sauce!! 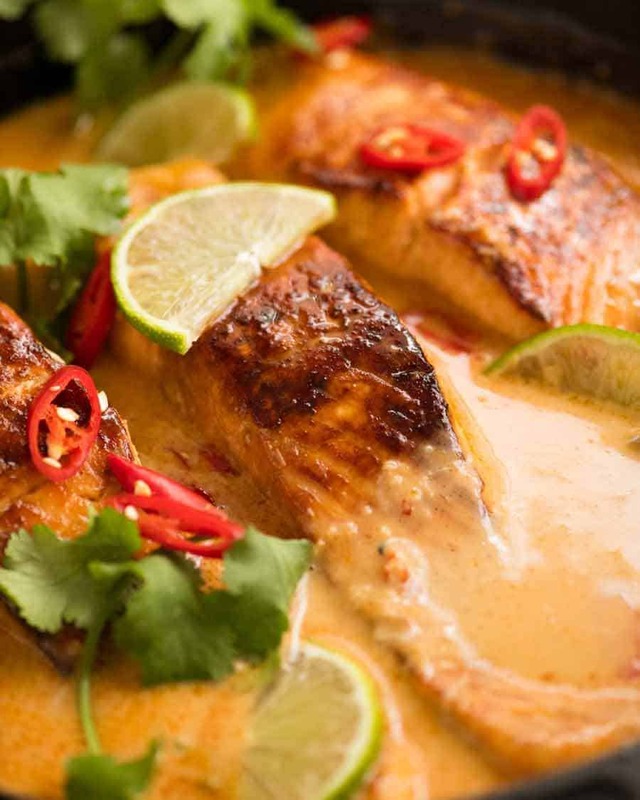 Tastes like a Thai coconut curry sauce – but it’s quick and easy. The trick is to caramelise garlic, ginger and lemongrass with a smidge of sugar before adding the coconut milk. It’s incredible what a difference it makes! Poached fish has a bad reputation. The mere mention of it conjures up visions of pale, overcooked, flavourless fish swimming in murky water. It’s time for a makeover. 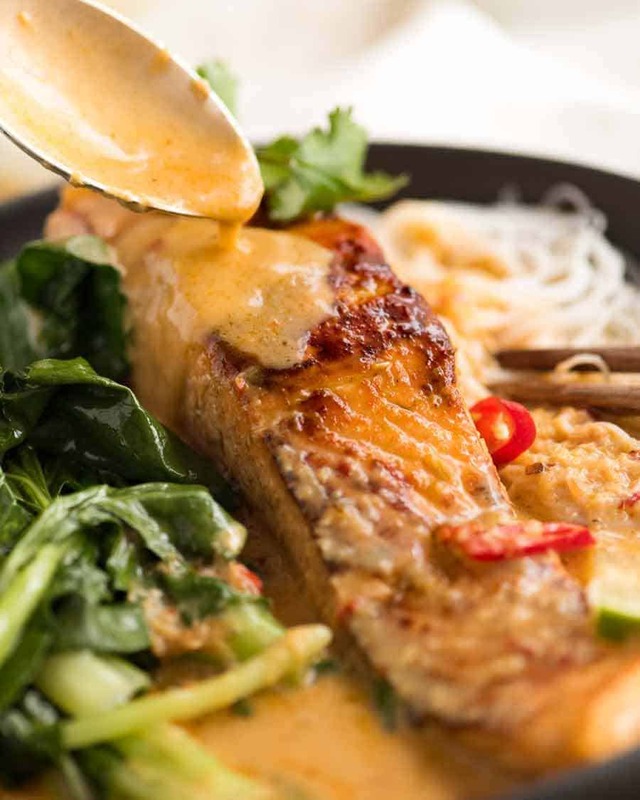 This poached salmon is lightly seared on the outside first then we finish cooking it by poaching in a simple Thai coconut curry sauce. The “normal” way to poach salmon involves bringing a pot of water to the boil with some basic aromatics like lemon and sprigs of herbs, then the salmon is gently simmered until it’s cooked. This isn’t my favourite way to cook salmon. I miss the flavour you get from searing. So my method of making poached salmon involves lightly searing first THEN poaching in the same skillet. Coconut Curry Sauce – real easy! Looks like Thai Red Curry, tastes like Thai Red Curry…..
Sure, it doesn’t have quite the same depth of flavour – but it requires a fraction of the time and ingredients. I think even those with sophisticated South East Asian palettes will still be mighty impressed with the flavour of we manage to get in this so quickly and with so few ingredients! 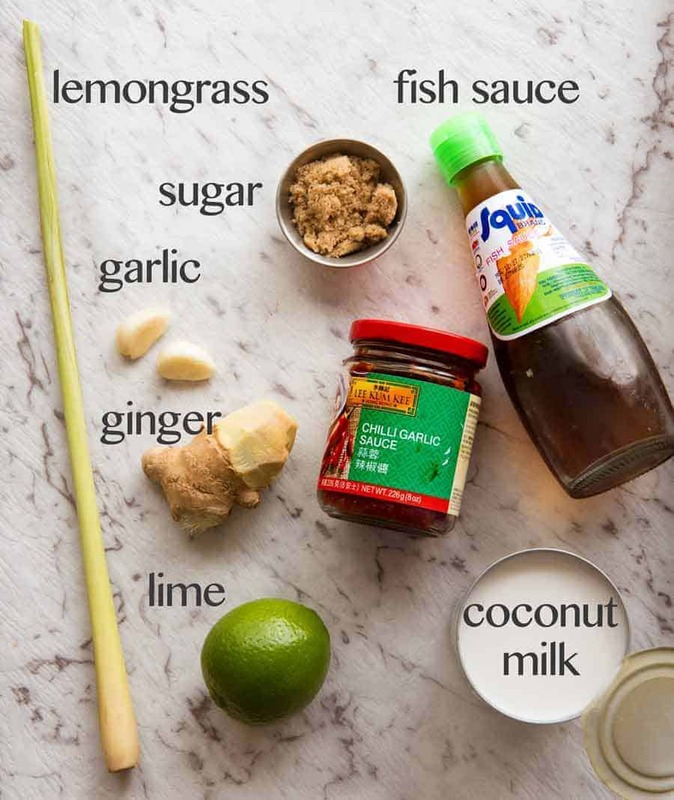 Here’s what goes in the coconut curry sauce – and it’s all things you can pick up at supermarkets. The one thing that some supermarkets may not carry is Chilli Garlic Sauce which, as the name suggests, is a spicy garlicky paste. But don’t worry if you can’t find it – just sub with any chilli paste, even if it’s not Asian (eg Franks), OR use a chilli sauce like Sriracha. Caramelisation makes all the difference! If you’re looking at the ingredients suspiciously, thinking surely she’s exaggerating, how on earth can so few ingredients make a coconut curry sauce that tastes like Thai Red Curry? I don’t blame you. I’ll be honest – I’ve tried a few simple Coconut sauces before and been disappointed. Sear the salmon first. 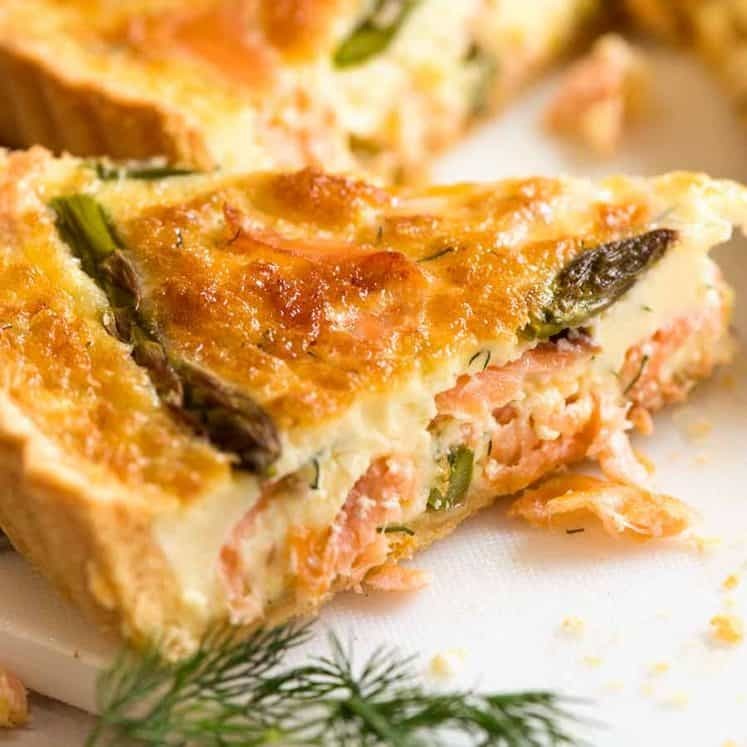 Just lightly – to add colour and flavour to the salmon as well as leaving behind tasty brown bits in the skillet (it’s called fond!) that adds flavour into the sauce. This is a cooking fundamental – never waste those precious golden bits from searing things! Caramelise the aromatics (garlic, ginger, lemongrass) with a touch of sugar. It’s amazing how much more flavour that adds to an otherwise simple sauce! 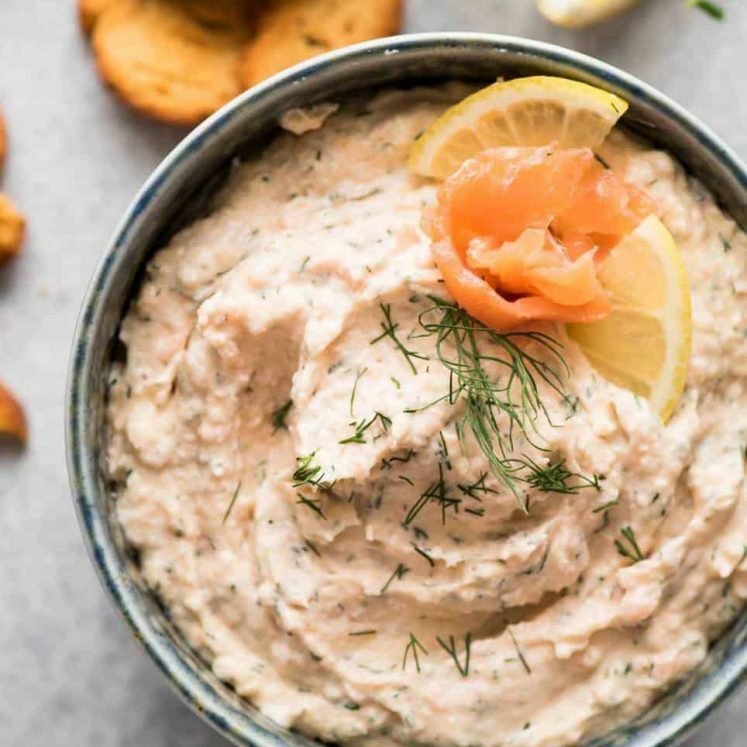 PS If you’re wondering if salmon is good for you, the answer is yes, we should all eat more of it! It’s rich in protein and Omega 3 fatty acids which do all sorts of good things for you – brain, joints and heart. So don’t shy away from salmon because you think it’s too fatty or too high in calories – it’s good fat. And if you love coconut milk sauces, you’ll love these! Recipe video above. 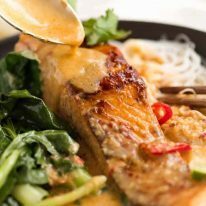 Poached Salmon in a coconut lime sauce that tastes like a Thai coconut curry - except it's super quick and easy to make! Even though the salmon is poached, it's well worth searing lightly to brown for the extra flavour on both the salmon and in the sauce. Sprinkle both sides of salmon with salt and pepper. Heat 1 tbsp oil in a non stick pan or well seasoned skillet over medium high heat. Add salmon, skin side up, and sear for just 1 1/2 minutes until golden. Turn salmon and cook the other side just for 1 minute, then remove onto a plate (should still be raw inside). Turn heat down to medium low and allow skillet to cool. Heat remaining 1 tbsp oil. Add garlic, ginger and lemongrass. Cook until garlic is light golden ~ 1 minute. Add sugar and cook for 20 seconds until it becomes a caramel (see video). Then stir in chilli paste. 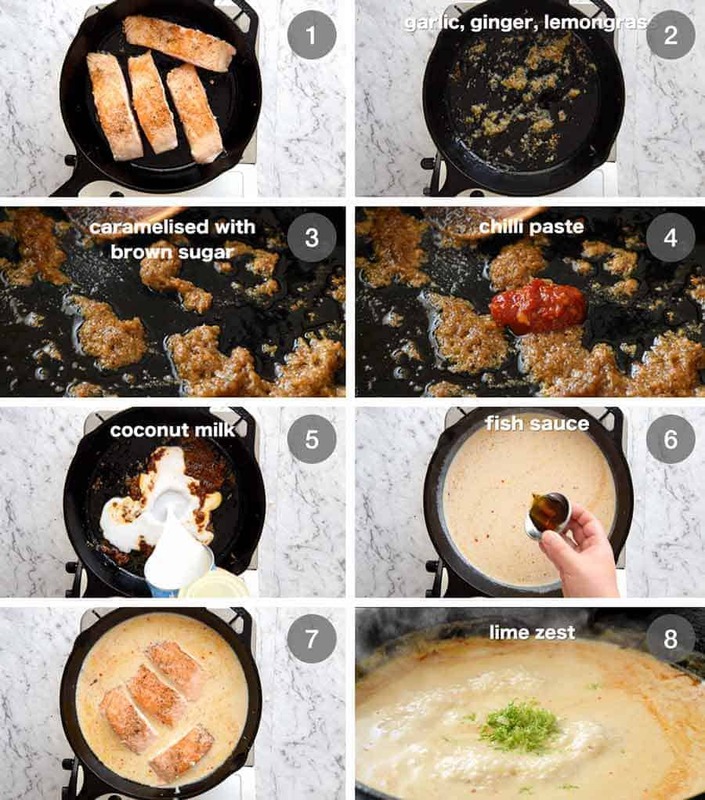 Add coconut milk and stir, scraping the bottom of the skillet to dissolve any bits stuck on the base into the sauce. Stir in fish sauce, increase heat to medium. Simmer for 2 minutes. 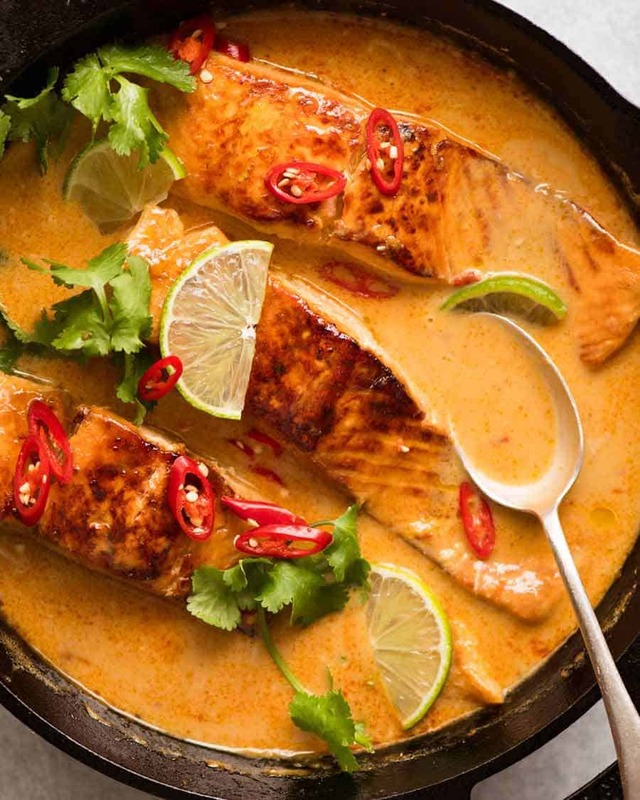 Place salmon into the sauce, lower heat and simmer gently for 4 minutes, or until just cooked. Remove salmon, stir in lime zest and juice to taste. Adjust salt to taste with fish sauce. Serve salmon over noodles or rice. Spoon over sauce, garnish with coriander and chili if using. 1. 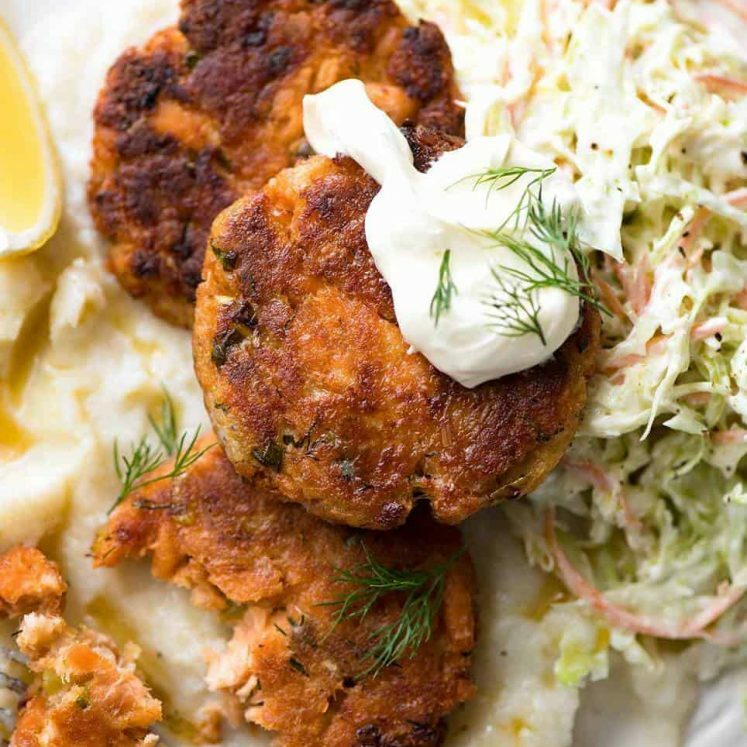 Salmon - Skinless is better for this dish because it's not a crispy skin salmon recipe. But skin on is ok too. 2. Lemongrass - peel reedy outer layers and just use the bottom 12cm/5" of the stalk, the part that's white and very pale green that can be grated. Lemongrass paste can be used instead - stir in 1 tbsp once the coconut milk is added. 3. Chilli Paste - Any chilli paste is fine here. Even sriracha or other Asiany hot sauce. This is to add spiciness and adds colour to the sauce. 4. Low fat coconut milk can be used but the sauce won't have as good a coconut flavour and will be a bit thinner. 5. Variations - This recipe works great with any fish, prawns/shrimp, chicken (thighs or breast halved horizontally or bite size pieces). 6. Nutrition assumes all sauce is used. Remember - all those Omega 3 fatty acids in salmon are good for you! Good for your brain, heart and joints! 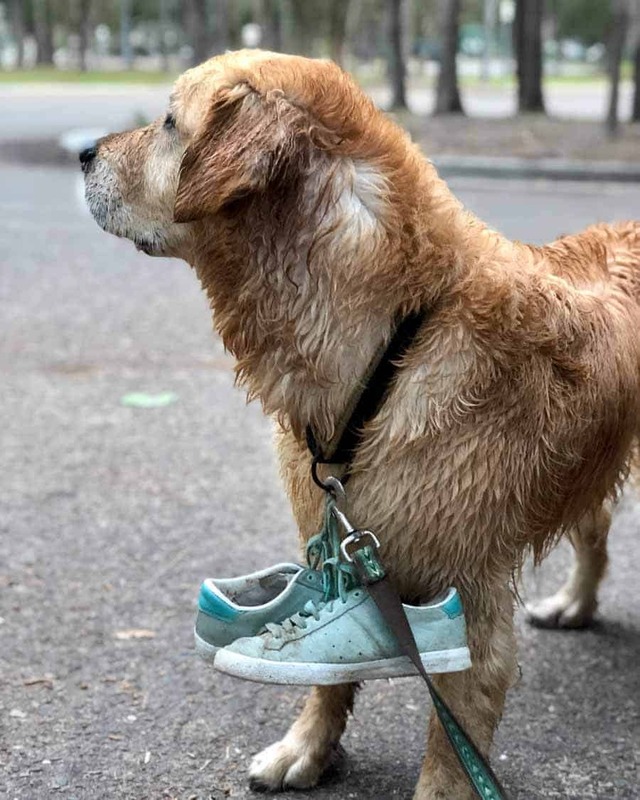 That time he got my sneakers wet so I took them off and made him carry them back to the car. Wow. Soooo delicious!! Served with jasmine rice and greens. Outstanding recipe! Thanks so much for the greta feedback Tim! I have cooked this twice now and love it! Question: Could the sauce be made a day in advance and then poach the fish the next day? I know I wouldn’t get the depth of flavor with the fish bits. But I wondered. Ah that’s so helpful, thank you for that tip! They were definitely on the thick side so I knew it was a user error on my part, but just couldn’t figure out when they were quite done! AMAZING flavors though, I will definitely be trying this again 🙂 Thank you for taking time to send this tip and reply back! So delish! I kind of doubled all the seasonings tbh and it turned out fantastic! Also added a head of broccoli and a chopped bell pepper to the sauce with the salmon, plus a few handfuls of spinach right at the end after I removed the salmon from the sauce, then served it over roasted sweet potato. Perfect weeknight dinner! Sounds like you nailed it Jillian! Outstanding! Even my non salmon loving man loved it!! That sauce…yum,! Wahoo! I’m so glad it was a hit Fiona! This recipe is so delicious the flavour was beautiful can’t wait to make it again luv your website. I give this recipe 5 stars, it was amazing. Love the sauce can’t wait to make it again. Love your website. I made this last night and it was absoluely delicious. The flavour was amazing, Love your website and have made loads of your recipes. I give this 5 stars can’t wait to make it again. I made this totally Keto. I substituted Lakanto golden for the brown sugar. It carmelized nicely. Wasn’t sure it would work but it was fine. I upped the Chili garlic sauce for a bit more zip. I served it with asparagus and cauliflower and poured the sauce over it also when I served it. No noodles or rice but it was plenty of dinner. Even my husband (who doesn’t like coconut milk flavour) liked it. Sounds fabulous Claudia, I’m so glad you could adjust it to suit your diet! Loved this sauce! Used ramen noodles and they worked out well since I didn’t have vermicelli. Had to cook the salmon longer to make sure it was cooked all the way through. Overall, very delicious! Ramen noodles would have been fantastic Sonali, I’m so glad you loved it! Just made this and the flavors were sooo so delicious, but the salmon was very underdone. Do you have any suggestions on how to tell when salmon is done when poaching like this? Yum! We had a friend for dinner, he was telling me about a great curry fish dish he had previously had but was then even more impressed with this one. So easy too. Loved it! Sauce tastes super good too.. just one question, how can I thicken it? I made this for dinner tonight, and it was delicious! Terrific, I’m so happy you loved it! We made this tonight served with cauliflower rice and it was absolutely delicious!! Will definitely be making this again, I can’t wait to try it with rice noodles next time. Thank you!